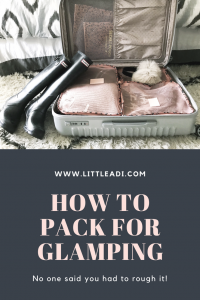 Best Packing Tips for Glamping – Little Adi + Co.
It’s finally gotten a little cooler here down south, and I’m itching to experience a little more of mother nature and her elements for the holidays. Something we don’t fully get to experience in Charleston, SC is snow, and with the boys being the perfect age to truly enjoy it, I set my sights on a secluded landscape where we could do a little family bonding time right before the chaos of Christmas. On my hunt for the perfect mountain retreat, I recently came across Glamping Hub, a site that’s sort of like AirBnB but for glamorous camping. It’s a directory of sorts for luxury camping sites from around the world. If you’re not familiar with the word “Glamping”, let me get you up to speed. 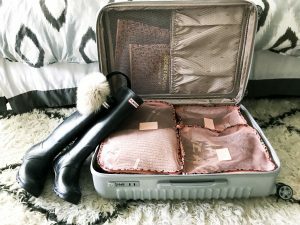 Now that we’re all on the same page about how amazing this Glamping thing is, let’s discuss packing. We’re headed to a luxury camping cabin on the Lake Shore in Nantahala National Forest, North Carolina, so I fully expect to freeze my bum off. Not only that, but I need to pack for the 4 of us + the dog. What would you pack for a glamping trip for a family of four? Lots of versatile layers. But the best part about camping, or in our case glamping, is only bringing the basic necessities and keeping things light. 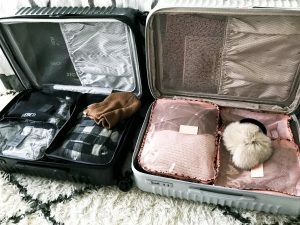 Keeping things light with 2 kids and a dog brings quite the struggle, but I’ve got some packing tips up my sleeve that will help keep anyone’s sanity when preparing for a trip like this. Plan ahead + check the forecast. Thank you Captain Obvious, but seriously, you’d be surprised how many people (including me!) assume the weather at their destination. “Oh, we’re headed to Mexico, it’s definitely going to be hot and sunny.” Yes, I’ve been there. It’s more important than ever be prepared for mother nature when you’re camping. Take 5 minutes and get your game plan. Check the weather app on your phone for the forecast, but take into consideration that things can change at anytime. We’re not staying in a tent, so it’s not as critical, but with my boys I want to make sure we have enough appropriate layers in case it gets too cold. We’re staying in the mountains after all and who knows what can blow in overnight! Go ahead, jot – it – down. Now that you’ve had some time to think about what you’ll need, make a list and check it twice. My pro tip on this one is don’t throw out your list when you think you’ve checked it all off! Pack that baby. It’s a lifesaver for when you’re packing up to head home and you can cross check to make sure you’re not leaving anything behind. Lay it all out and make sure you have interchangeable outfits depending on the weather. 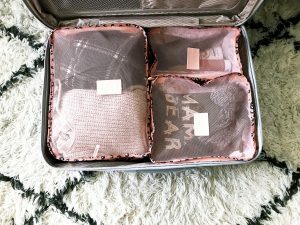 Use packing cubes and label each one per person. 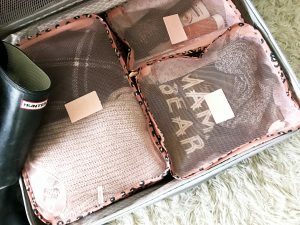 I first started using packing cubes when my boys basically began wearing the same size. Having everyone’s outfits for the weekend, nestled nicely in their own pouch, makes things 100% easier once we arrive. Not only can my husband figure out who wears what (and can help me with getting them dressed), but it also prevents everything in the suitcase from being destroyed the minute we unzip. Pack an empty reusable tote for groceries and snacks. limit the multiple trips back and forth for the groceries from the car. Not only do I fully expect it to be cold, but I also expect that our car will be on some sort of incline a little ways away from the door in the middle of a forest that has…friends (bears). And the fact that we’ll most likely be arriving in the dark is a good enough reason to keep this trip from the car to a single one. No matter the climate, always pack at least one scarf. It takes up virtually no room and can have so many different uses. Not only can it keep you warm in the cooler weather, it can also be used as a picnic blanket, something soft to sit on, and can even protect you from the sun. It also works great to create multiple outfits from the same top/bottom by varying up different colors and textures. It can dress up a boring travel outfit or can ball up into a pillow for that long car ride home. Thank you to Delsey and Glamping Hub for sponsoring this post. As always, all opinions are 100% honest and completely my own.